A restaurant brimming with character, the space creates an energetic, engaging atmosphere. With servers as quick with a smile as they are knowledgeable about their product, Pukka is a clean, modern social space ready to welcome you. Pukka is sure to surprise and delight. It's Indian like you've never tasted before! Harsh was born and raised in Northern India and he keeps his homeland in his heart wherever he goes. With an education and experience in business and marketing, Harsh arrived on Canada's fair shores to seek his fortune. His journey led him to overseeing the hustle and bustle of many a busy restaurant and there he found his passion. 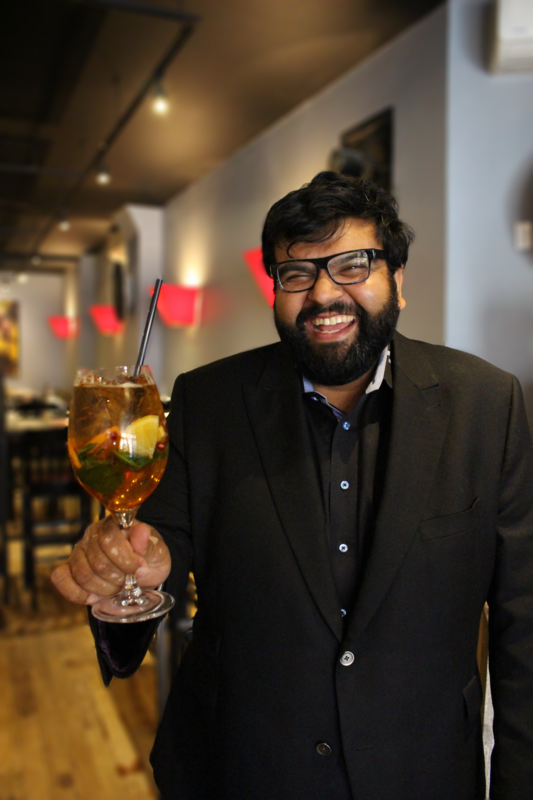 From ownership, running daily operations to being a restaurant consultant, Harsh has flourished in the industry. As a proud Papa, Harsh is eager to watch his family grow alongside his business. Harsh brings his zest for life, his fierce loyalty and his passion for finer things to everything he does. He is thrilled to lead the Pukka team alongside Derek. The heat of restaurant kitchens has warmed Derek's heart for nearly three decades. His career has spanned the gamut from busboy to owner and all posts in between. 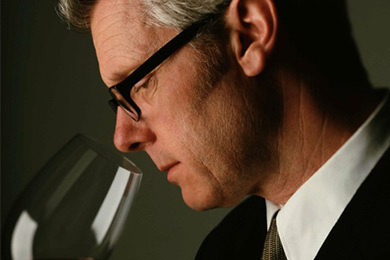 Derek's passion for good food and wine fuelled his livelihood, leading him to become a Certified Sommelier. As a husband and father, Derek's excitement for restaurants is only surpassed by his devotion to his family. Along with his wife and daughter, Derek has travelled to numerous countries and exotic locales. On a trip to India, Derek fell in love with the people, the flavours and the wholesome foods of the region. He is excited to bring these tastes home and showcase them in this new venture. Each member of our culinary team hails from a different part of India, bringing the spices and flavours unique to their home regions. 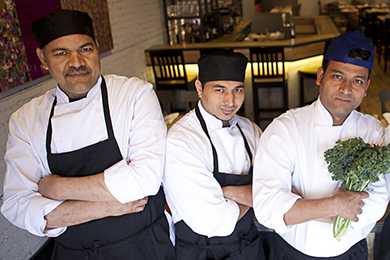 Trained in classic Indian cooking, the team has grown in their gastronomic artistry by incorporating techniques and tastes from all around the world. Having lived in several different countries while refining their art, the chefs came together on Canada’s fair shores. Seeking new challenges, these remarkable men expanded their delicious repertoires in several of Toronto’s top restaurants. Chef Kirti Singh and Chef Dinesh Butola have received many accolades for their exceptional cooking. With a half century of combined experience, the team eagerly brings their passion, flair and wealth of experience to the exquisite flavours of Pukka. Here the success continues for this incredible team. Peter was first bitten by the wine bug in the early 1980s and has been pursuing it ever since. In 1986, he followed the bug to France where he traveled extensively, studying wines and vines, before settling down to live in the Southern Rhône for a year. In Toronto, he has had the good fortune to have worked with so many distinguished Canadian chefs: Michael Stadtlander, Chris McDonald, Susur Lee, Greg Couillard, Massimo Capra, Paul Boehmer, and Keith Froggett at Scaramouche, where he has been employed as Sommelier/Wine Director since 1993. Asked by Derek and Harsh to join Pukka’s new team, Peter eagerly agreed because of the fascinating challenge of matching wine to this, the most complex of all cuisines. 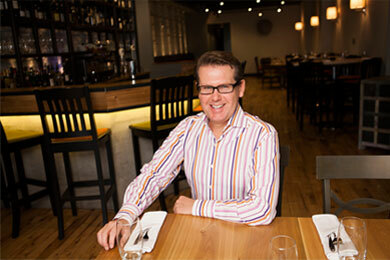 In addition to Pukka, Peter also consults on a number of other Toronto establishments’ wine lists, and has written about food, wine and pop culture for Canadian magazines. He has taught the ISG Sommelier Diploma course in Toronto, the highest level of instruction in Canada, for the International Sommelier Guild. As well, he plays jazz/blues guitar in local clubs and sessions, and has raised two excellent children.